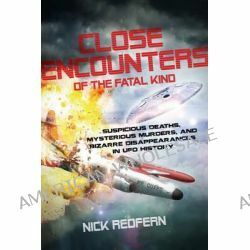 Close Encounters of the Fatal Kind, Suspicious Deaths, Mysterious Murders, and Bizarre Disappearances in UFO History by Nick Redfern, 9781601633118. « Complete Idiot's Guide to Vampires, Fascinating Vampire Lore from Eastern Europe, Greece, Italy, and the Middle East by Jay Stevenson, 9781592579433. Informacje o Close Encounters of the Fatal Kind, Suspicious Deaths, Mysterious Murders, and Bizarre Disappearances in UFO History by Nick Redfern, 9781601633118. Produkt został dodany 01.12.2014 14:35. Ostatnia zmiana danych produktu miała miejsce 01.12.2014 14:35.